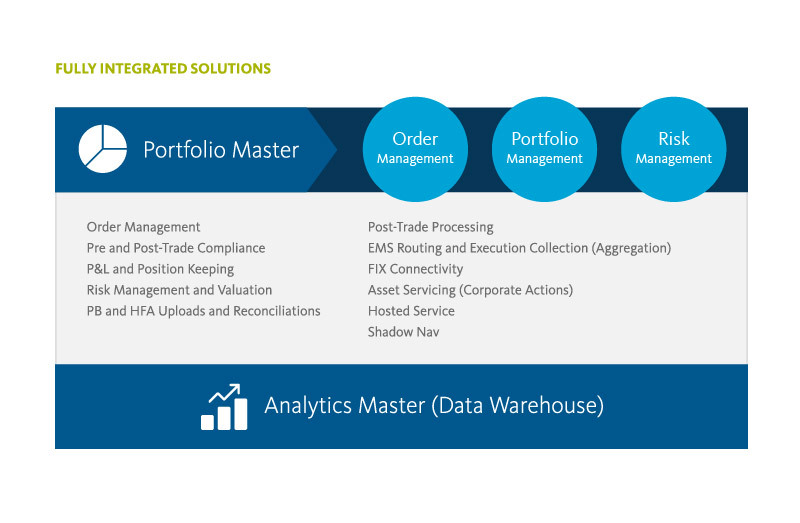 The keystone of Broadridge's Investment Operations Platform, Portfolio Master combines order management, portfolio management, and risk management in a single application, enabling fund managers to streamline their operations and reduce complexity in their mid-back office. Portfolio Master can help fund managers control exposure and inoculate their portfolio against adverse market conditions to protect carefully earned alpha. Also, actionable, up-to-date risk information can offer fund managers a competitive edge in volatile markets. With Portfolio Master, firms can manage risk — eliminating the need to integrate and manage risk management tools outside your OMS and PMS systems. This powerful combination of portfolio, order, and risk management with extensive reporting allows your firm to manage the full trade lifecycle in a single application. Comprehensive security coverage including equities, fixed income, FX, futures, and options, ABS/MBS and a wide range of OTC instruments (e.g., CDS, CDX, TRS, IRS, Variance Swaps, etc.). Flexible trade modeling and rebalancing for order generation. Complete electronic trading and order routing solution with FIX connectivity to executing brokers, trade algorithms, and industry-leading EMS’s platforms. Real-time position and P&L viewer with seamless integration to real-time market data feeds. Integrated pre- and post-trade compliance tools including real-time alerts, customizable rules, and full audit reporting for firm-wide compliance management. Dynamic connectivity with prime brokers to identify short availability and locates in real-time OTC valuation, sensitivity analysis, and fixed income analytics. Historical as-of-reporting (i.e., DTD, MTD, QTD, YTD, or custom periods). NAV analysis, calculating, shadow accounting, and reporting. View impact of scenarios on any set of positions, portfolios, and statistics. Compare the impact of scenarios on actual and model portfolio positions. View the impact of user defined changes to the current market environment (including prices, currency rates, yield curves, and volatility surfaces). 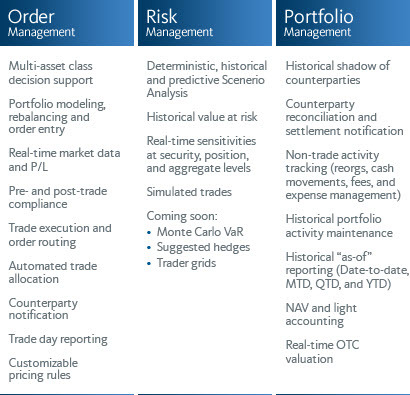 View the impact of historical scenarios on current market environment. User defines shifts in core market variables and Risk Engine propagates to the market environment via multi-linear regression. Calculate VaR intraday (including marginal, incremental, component, and conditional). Calculations performed on any set of positions or portfolios. Update viewed results in real-time as quantities change. New securities and trades automatically swept to Risk Engine. Historical Market Data provided by Broadridge. Dedicated Risk Engine resources are separate from other. Automated security terms and conditions setup and maintenance. Cash management and inception-to-date record keeping.